Using data from the NRMP program results, we find an interesting trend between number of applying candidates, applicants interviews, ranked to a program and matched numbers. The figure below shows the mean number of interviews, ranked and matched applicants in Primary IMG friendly specialties. A similar analysis of secondary IMG friendly specialties has been done and can be read at the link provided. “Interviewed” refers to the average number of applicants a program has interviewed. “Matched” refer to the average number of applicants that match into a program. This is generally the number of positions that program has. “Primary IMG friendly” program refers to specialties which IMGs apply and are the core group of IM, FM, Peds, Psych. 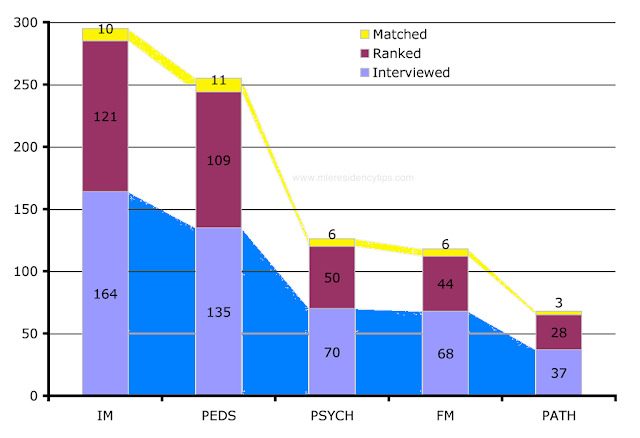 As can be seen in the figure, Programs in internal medicine had the highest average number of applicants interviewed. IM also has the highest number of applicants ranked to programs and a high number of applicants that matched. Pediatrics was pretty close to medicine when it came to mean number of applicants interviewed and ranked. Pathology typically is not IMG friendly but was included here to keep the balance of specialties from secondary IMG friendly programs. Family medicine had the least number of applicants interviewed per program amongst the BIG four, ranked per program and matched per program. The numbers in the bars denote the mean number of applicants for respective category. What is the implication of this information? Thus to maximize chances in matching in say, FM you likely need 11 interviews and so forth. This is the mean and numbers can be different for individual programs. This is slightly different for IM because by that comparison, one would say, 'you need 16 interviews to secure a match to at least one program'. There are 2 off shoots of this statement, one, you do not need 16 and any number between 10 and 15 should do the job. This explained by the fact that residency match is not a straight mathematical probability problem, the human element plays a big role. Second, there is a strange trend of having 15+ interviews and the rate of matching going down this has a few possible reasons as well which are discussed in article link provided. If some one has the above number of interviews, then the chance of matching is exceptionally strong. However, you only need one interview to match because, if you ace that one interview, you can still be ranked at the top of a program ROL and match into that program. Therefore if you do not get as many interviews, do not be disheartened instead focus on the few you have! If you wish to be in touch and get the latest posts and updates, join me on Facebook or follow me on Twitter. Also Scroll below ↓ for the most popular articles this week!